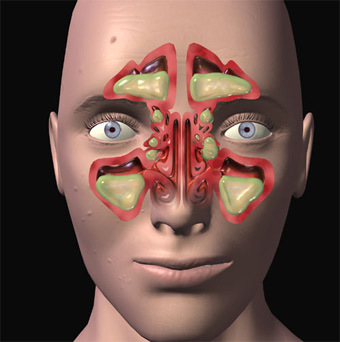 Sinusitis is a common health problem today. Ayurveda believes in treating the root cause of the problem, and trying to prevent it as far as possible. Although there are plenty of reasons for onset of Sinusitis, the foremost is the high pollution levels in cities today. Smoke, dust and humidity in the environment are prime irritants for sinus glands. These can further irritate the already inflamed sinus glands, leading to infection. Not many of us are aware that food and sinusitis are interlinked. For instance, excessively oily, salty or spicy food can increase the production of fluids that block the sinus glands. Hence, try to avoid foods such as chips, pickles, food prepared by adding excess spices and artificial flavours, and sour food, including fruits. Further, prolonged use of air-conditioners can cause sinusitis onset. Ayurveda believes that even a change in bath routine can aggravate the condition. It is suggested that the best time to take bath is before 9am or after 5pm. Having a bath at noon and after meals, will do more harm than good to your body. Also, ensure not to keep changing your hair massage oil frequently when washing hair. Sinusitis can be treated in various ways. The best method is to avoid situations that trigger the problem in the first place. For this, you may have to sit with your physician and discuss your day to day lifestyle habits and routine including your workplace environment, transportation used to commute to your workplace, food habits and diet, your daily bath routine and time, duration of your sleep, any medications used, and all such details. With the help of your physician, work out on the possible triggering factor, and try to incorporate and follow the physicians advice in such matters. The already inflamed sinus glands may sometimes worsen due to certain triggers, leading to headache, body pain, fever, tiredness, and respiratory problems. In such a situation, the patient should be allowed to take complete rest. Apart from treating fever, the patient needs to be administered medicines to reduce the sinus inflammation. Ayurveda generally recommends Punarnavadi kashayam, Pathyashadangam kashayam, Amrithotharam Kashayam, Amritharistam, Punarnavasam, Suryaprabha tablets, are prescribed as and when required. Sinusitis, unlike other health problems, requires long-term treatment for complete cure. Hence, improving the natural defence mechanism of sinuses, and boosting general health and immunity are the prime requirements for long-term relief from sinusitis. Nasya, massaging with appropriate oil, medicated steam inhalation and special gargling solutions are some treatment methods adopted by ayurvedic physicians. Depending on the health condition of each individual, certain medicines such as Thriphalaadi, Raasnadi, Vachadi, Nirgundyadi, and Asanamanjishtaadi, are used for treatment. One of the main aims of the treatment is to reduce the frequency of onset of sinusitis. Rasayana treatment can help prevent recurrence. The appropriate medicine will be used for the treatment, for certain duration. Thippili, Chyawanprash, Agasthyarasayanam, are normally used for Rasayana treatment. It helps reduce frequency of disease onset and prevents recurrence in the long-term. For relief from sinusitis related headache and respiratory problems, drink fresh ginger juice with honey several times a day. This can help reduce inflammation of sinus glands. Another simple home remedy is to boil water by adding tulsi leaves and turmeric, and use this for steam inhalation. Adopting the right treatment method, together with necessary lifestyle modification, can help in curing Sinusitis completely. Ayurveda guides you through the right path for complete cure of the condition.